What is his value in the next say.. month or so. Working on a deal that would get me Corey Hart and I would deal Duda/Middlebrooks. I like Middlebrooks a lot and obviously and dont want to deal him.. but if he gets sent down then obviously I would want to move him. Clock ticking. I've got Chipper at 3B right now but have a feeling he's not going to play that much this week. Im thinking about dropping him and slotting in Middlebrooks but Im afraid Youk will be back this week and steal time from him. Can I get a consensus on what you think Middlebrooks chances are of playing full time this week and in the near future? GHirsch516 wrote: Clock ticking. I've got Chipper at 3B right now but have a feeling he's not going to play that much this week. Im thinking about dropping him and slotting in Middlebrooks but Im afraid Youk will be back this week and steal time from him. Can I get a consensus on what you think Middlebrooks chances are of playing full time this week and in the near future? I'm guessing that Middlebrooks is available in your league? If that's the case I'm guessing Chipper will also still be available in a week or so if you drop him. 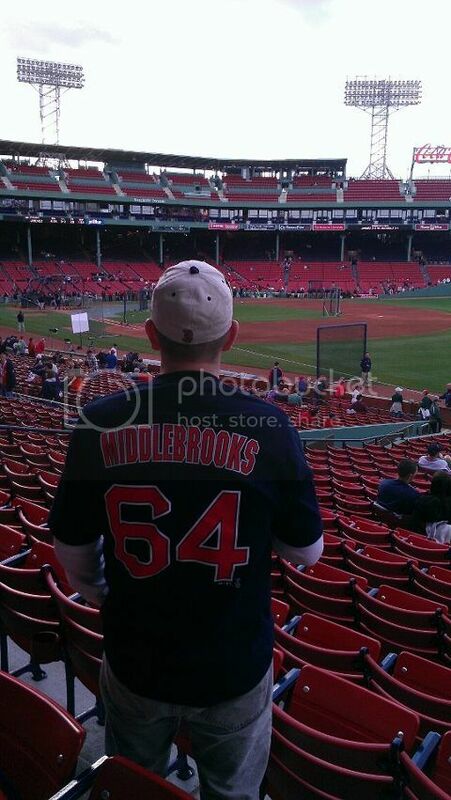 As for Middlebrooks' playing time, I don't think that anyone really knows right now. One thing is certain, the Sox need his production. I'm going to roll with Middlebrooks this week. I just read an interesting piece that came out today from B/R in regards to my question. http://tinyurl.com/bqccsl8. Im going to say this will be a critical week for Middlebrooks with Youk returning. If he continues to produce like he has the past 2 it's going to make it near impossible to send him back down. you bet I paid $30 for this the other night. CBSSports.com baseball insider Jon Heyman reports the Red Sox plan to demote Will Middlebrooks (likely to Triple-A Pawtucket) once Kevin Youkilis (back) is ready to come off the disabled list. Where else would they send him? Maybe Bill Beane would still take Youk. They really have no choice if they want Middlebrooks to play every day. Element wrote: Maybe Bill Beane would still take Youk. They really have no choice if they want Middlebrooks to play every day. The A's just put Cespedes on DL so I'm not sure if they have any DL spots left for Youkilis.